LENNYS Grill & Subs is the place to find World Class, authentic Philly Cheesesteaks served hot off the grill, delicious subs with meats and cheeses sliced about 37 seconds before landing on our made-to-order sandwiches, and fresh sliced veggies piled high on freshly baked, craft bread. And all of these delicious ingredients go great on our salads as well. Our commitment to our guests is clear. The quality of our product creates a passionate, loyal customer base with solid repeat business. Lennys Grill & Subs believes in huge portions, fresh products and premium ingredients. We bake our bread fresh each morning and slice all meats and cheeses to order. Our portions are some of the largest in the sub sandwich segment. Our regular sub is 7.5 inches long and contains almost a half-pound of meats and cheeses. Our large sub is 15 inches and contains almost a full pound of meats and cheeses. Our cheese-steaks are cooked fresh to order and delivered hot off the grill. We believe they are one of the best Philly cheese-steaks you’ll ever try. 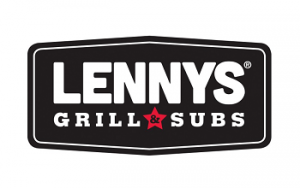 LENNYS Grill & Subs exemplifies the benefits of a franchise system. We are a simple concept in a wholesome environment and our employees have great personalities. We have implemented many subtle touches to ensure better guest experiences, including larger tables, bigger booths, no trash cans and hand delivered beverage refills. It helps create a better dining experience, differentiates us in the sub sandwich industry and promotes brand loyalty among our guests. Ready to learn more about Lennys Grill & Subs? Please request more information below now! We provide a minimum of five weeks of in-depth training to new franchisees. Our training is hands-on, four weeks spent in a shop, along with one week at LENNYS University and at our company owned restaurant in Memphis. We provide franchisees with a Point of sale system that provides support tools and business intelligence, 24/7 assistance from your LENNYS Franchisee business Coach, a Restaurant manager Certification Program, LEARN — our online training solution, marketing support, and complete guides to our brand standards and operations.